Torcular is based in the countryside next to the village of San Giuliano di Puglia (in the province of Campobasso, Molise). The village stands at 476 metres above sea level and is surrounded by green hills and ancient olive trees. 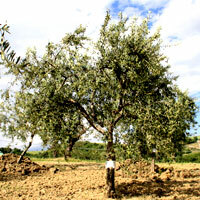 Our own olive grove is centuries old. We have a number of different varieties of olive tree within our grove: 'l'oliva nera di Colletorto', 'Gentile di Larino', 'Rosciola di Rotello' and 'Peranzana'. All of these are protected species (Denominazione di Origine Protetta, D.O.P.) and recognised as indigenous species that form part of the heritage of our region.